"I always take my Kindle Fire with me no matter where I go. It is such a convenient and compact tablet that I can read, listen to my favorite playlist, and watch videos as well whenever I want. However, Kindle Fire seems incompatible with PPT. This is baffling when I need to view some PowerPoint files on my Kindle Fire. I suppose there are solutions to solve this, right? ." Though PPT is incompatible with Kindle Fire at the moment, it can be resolved by converting PPT to Kindle Fire compatible format. Find more details from the below article. The Fire Tablet, formerly called the Kindle Fire, is a tablet computer developed by Amazon.com. It is built with Quanta computer, featuring a color 7-inch multi-touch display with IPS technology and running a custom version of Google’s Android operating system called Fire OS. In total, it provides 8 GB internal storage in the first-generation Kindle Fire, approximately 6.5 GB was available for contents. That is to say, you can store pretty much contents including text, books, music, and videos on your Kindle Fire. 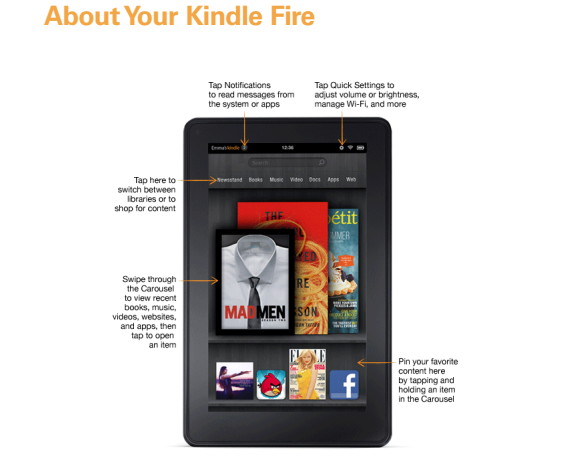 What Kindle Fire can do is far more than an e-book. But if you want to view PPT on Kindle Fire, you have to convert PPT to another format first. From the Kindle Fire manual, we can learn that not all formats are supported by Kindle Fire; and yes, PPT is one of the not-supported formats. Check the below table for detailed supported formats by Kindle Fire. As you can see, PPT series file extensions are not among the supported format category, and the good news is even though PPT cannot be open directly on Kindle Fire, we can still find a way around to let PPT viewable on Kindle Fire. Keep reading. The first solution coming to your mind may probably be saving PPT as PDF within Microsoft office for Kindle Fire. You can simply ready your PowerPoint presentations and save the file in PDF format, then transfer the PDF to your Kindle Fire for reading. Steps to save as PDF is listed below. Step 1: Open your PowerPoint. Get ready all contents. Step 2: Save the file in PDF format. 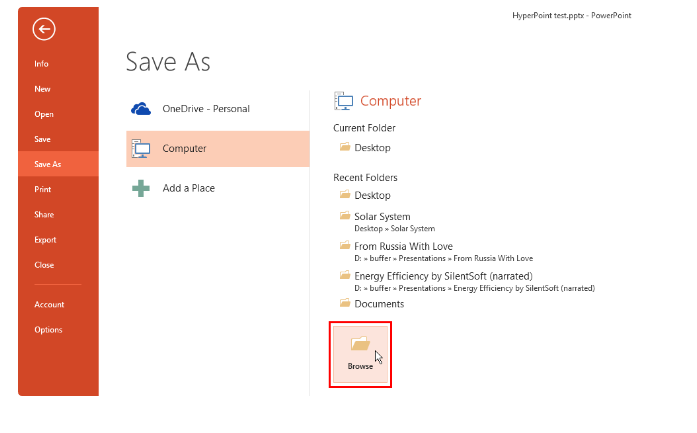 Click Save as from the File menu, pick Computer and click Browse on the right pane. Step 3: Select PDF from the Save as type list. Otherwise, you can refer to Kindle support for details. In this case, Kindle Fire can directly open the file and allow users to view them freely. Note that saving as PDF won’t help keep the elements in a PPT file, such as transition, animation, music, and so on. Only text contents are kept so it is somehow not friendly. 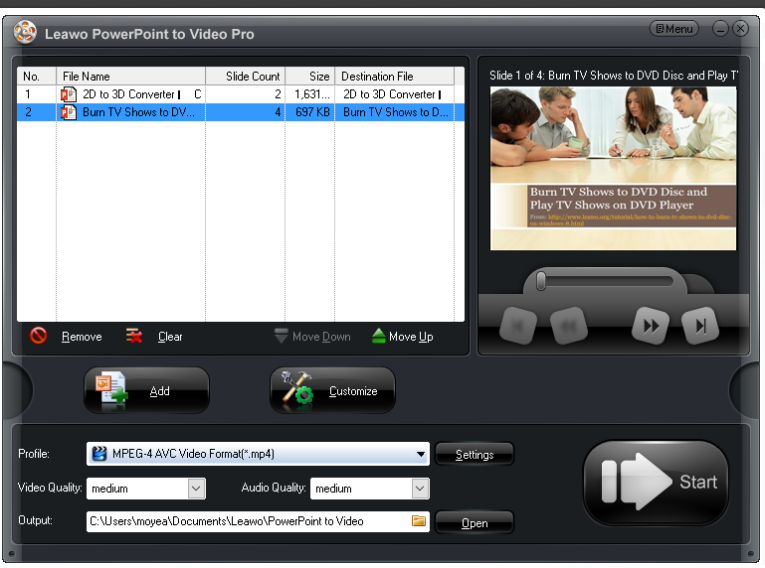 To keep all elements in the PPT, we can consider to convert the PPT to a Kindle Fire compatible video format, Leawo PowerPoint to Video Pro is a good choice. It develops a series of user friendly features to help users to convert PPT with background music, logo, and the like. Files can be processed with this app effortlessly and the one-stop solution makes the file conversion experience remarkably enjoyable. Step 1: Download Leawo PowerPoint to Video Pro. Click the below button to install this app. ☉ Support all PPT formats: PPT, PPTX, PPTM, PPS, PPSX, POT, POTX, POTM. 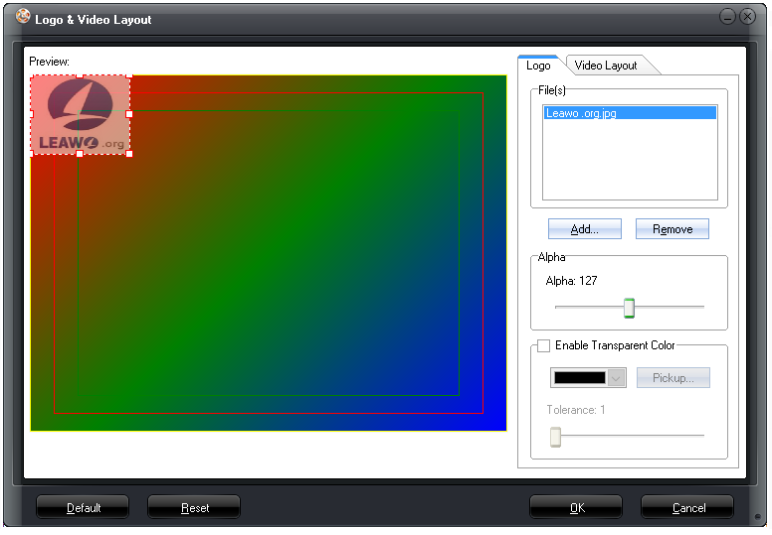 ☉ Adjust video and audio parameters of output files. ☉ Customize PowerPoint files like: insert background music/watermark, set transition, real-time narration. Click Add to import files. I suggest you import files in batches and process at a time. Step 3: Set an output format. View the formats from the Profile drop-down list and pick one accordingly. Here we tap iPad. Step 4: Make the file more powerful and attractive. 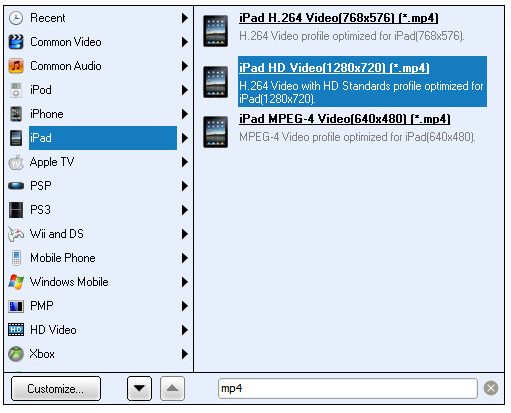 Click Customize to set the file parameters in details, such as set the video quality, audio codec, music, and others through the Customize settings pane. Step 5: Protect the file with unique watermark. Click Watermark to add a unique logo or trademark to protect your file. If done so, the file cannot be copied or edited randomly. Step 6: Convert PPT to Kindle Fire compatible format. Click Start to process the file. View the process through the green progress bar. After all is done, transfer your video to Kindle Fire using USB cable. All in all, Amazon PowerPoint presentation is odd because Kindle Fire cannot open PPT natively. There are a variety of ways to solve this, among which saving PPT as PDF is the most direct way. The only problem for PDF is that it cannot keep PPT elements. 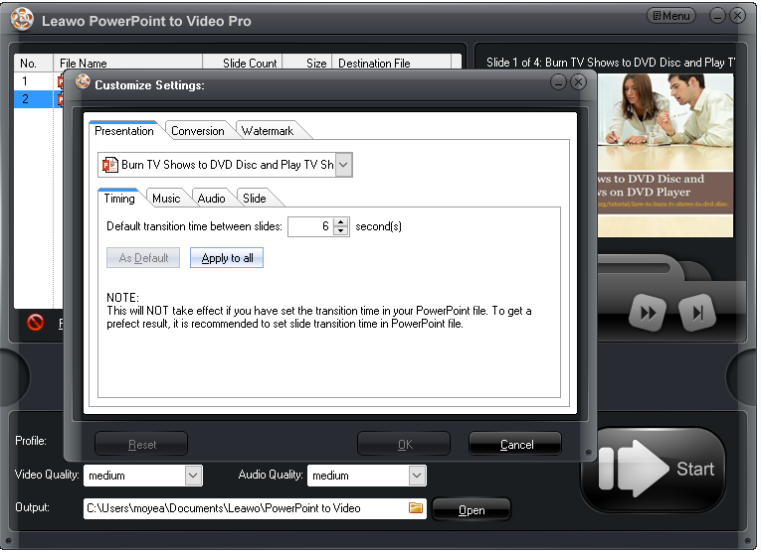 To our joyfulness, Leawo PowerPoint to Video Pro can perfectly retain original elements in a PPT file. By the way, the customization features provided by this app also highlight the overall performance and ranking in the industry, making it very popular among global users. Do not hesitate to give it a shot.